Background photo by Ladislav Luppa. The National Bank of Slovakia have issued (20th September) a new coin which remembers one of the country’s leading exponents in the late realism style in Slovak literature on the 150th anniversary of her birth. Božena Slančíková-Timrava (1867 – 1951) typically featured rural workers, the rural intelligentsia, and groups promoting Slovak national interests in her stories. She also introduced a type of character new to Slovak literature — a woman with a more developed psychological profile who feels sorrow and disillusionment in relation to the fin de siècle social atmosphere. This style was thought by many to be more auto-biographical in nature. Her works on more than one occasion did display autobiographical elements, criticism, irony, and a focus on character psychology. In her later writings, she concentrated on serious social issues. During her long career, Timrava also wrote plays occasionally, but these did not reach the heights of her other literary works. The coin is produced by the Kemnica Mint on behalf of the National Bank of Slovakia and designed by Asamat Baltaev. Its engraver is Filip Čerťaský. 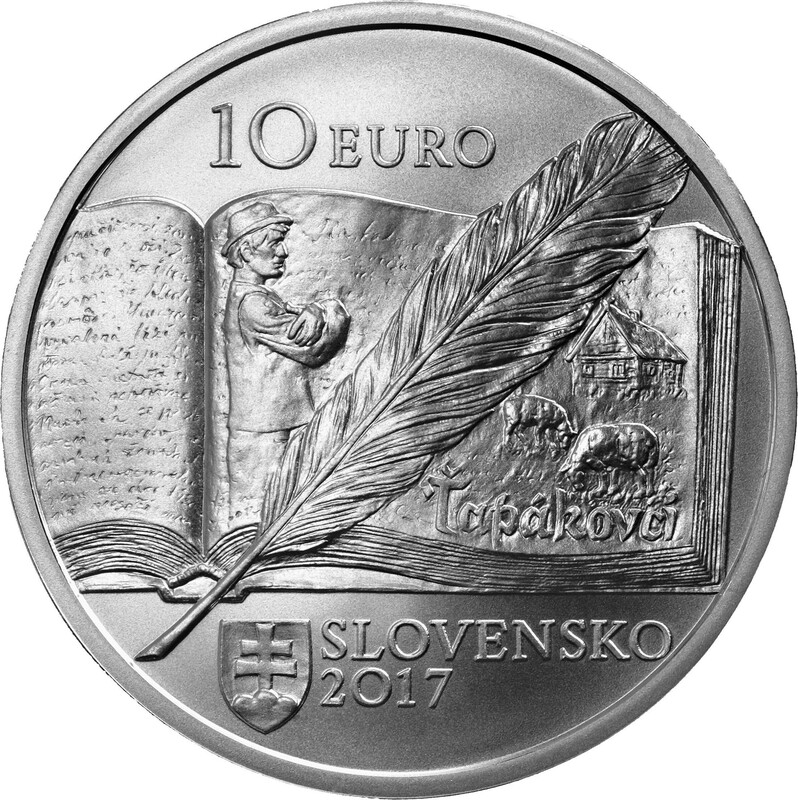 The obverse side of the coin depicts an open book with a motif from Timrava’s well-known short story “The Ťapáks.” Superimposed over the book is a quill. In the lower part of the coin is the coat of arms of the Slovak Republic, and next to that is the name of the issuing country, SLOVENSKO, above which is the year of issuance, 2017. The denomination, 10 EURO, appears in the upper part of the coin. 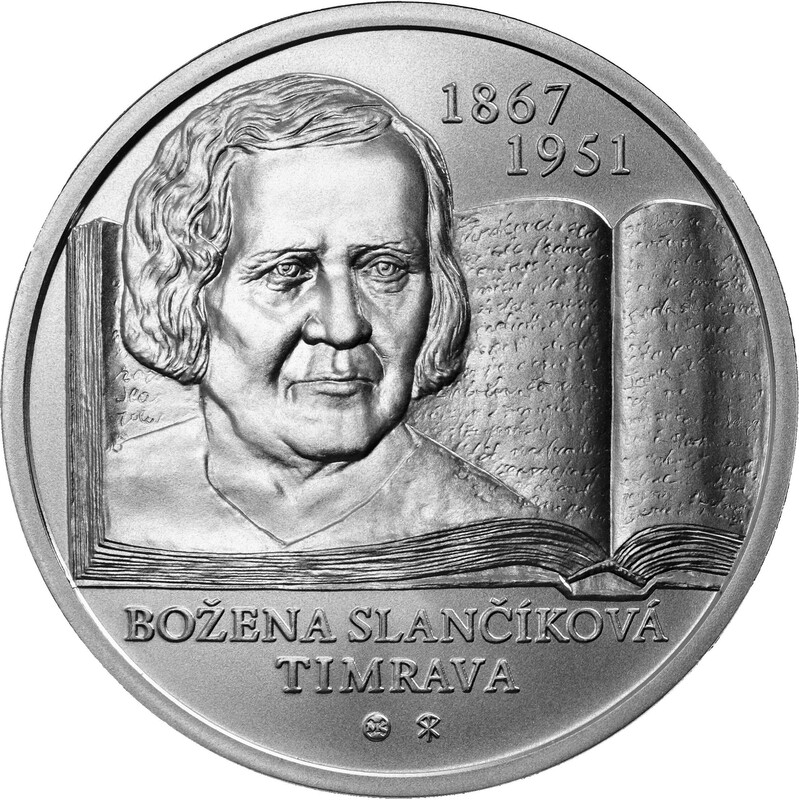 The reverse features a depiction of Božena Slančíková Timrava which is based on an actual photograph of the author believed to have been taken in 1937, and is set against the page of an open book. Her first and last names, BOŽENA SLANČÍKOVÁ, are written below the book, and below them is her pseudonym, IMRAVA. At the bottom of the coin is the mintmark of the Kremnica Mint and the initials of the designer. The dates of Slančíková Timrava’s birth and death, 1867 and 1951, appear in the upper part of the coin on two lines. 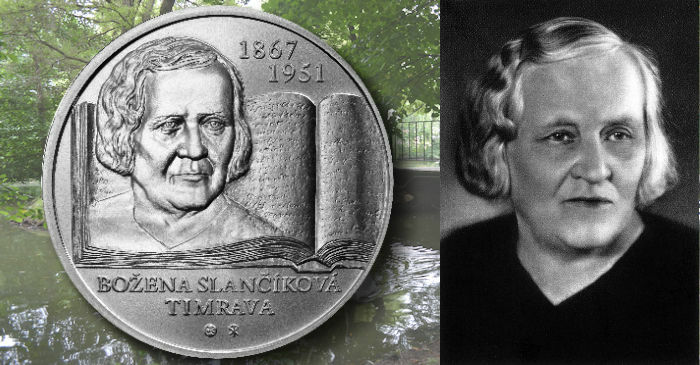 The edge of the coin carries an inscription PREDSTAVITEĽKA NESKORÉHO LITERÁRNEHO REALIZMU (Exponent of Late Literary Realism). The coin is minted in both Brilliant Uncirculated and Proof quality. For more information on this and other coins issued by the National Bank of Slovakia, please visit the website of the Kremnica Mint. 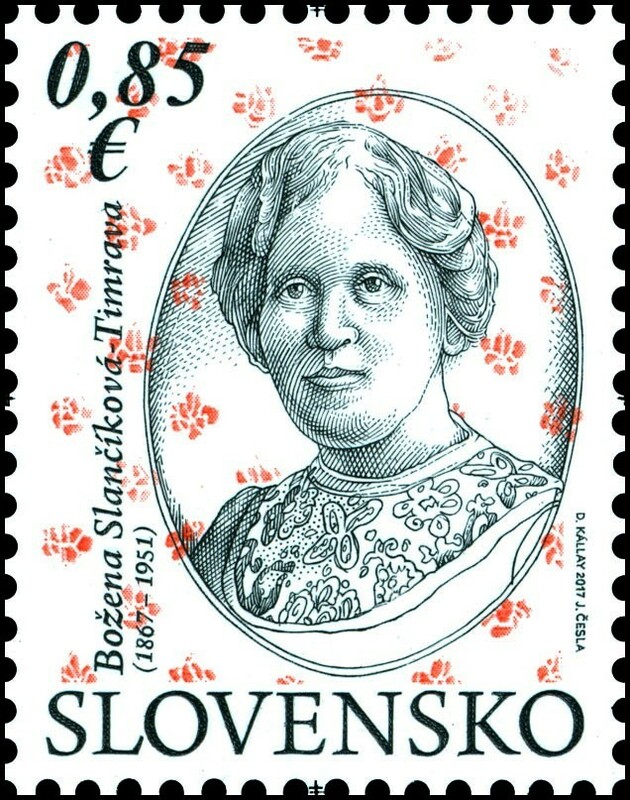 Božena Slančíková-Timrava was born on the 2nd October 1867 at Polichno. Her father was a Lutheran pastor and one of the co-founders of the Slovak cultural organisation Matica Slovenská. A commemorative silver coin was issued by the Czechoslovakian National Bank in 1988 on the occasion of their 125th anniversary. After attending the village school in Polichno for two years, she was then taught with her siblings by their father. In 1909, after he died, she and her mother went to live with her brother in Ábelová, where from 1919 to 1929 she held the position of a kindergarten teacher. In 1945, she moved to live with her relatives in Lučenec. Despite her popularity and notoriety, her writing earned little more than symbolic royalties. Due to the conventions of the time and to the fact that she did not marry, she had to struggle much of her life to get by and continued in a salaried position. Timrava’s writing talent and private life reflected conditions in the out-of-the-way towns of the Novohrad region, but at the same time, it also reflected the creative atmosphere of her family circle. Her professional literary career began in 1887, when, along with her sister, she prepared the manuscript for the magazine Ratolesť (Sprig). Between 1886 and 1897, she wrote satirically edged poems that gradually took on a self-ironic character. Many would later become plot material for short stories set against a background of intellectual village life, whose dominant theme was usually the relationships between men and women. This style would eventually come to define her work in the literary genre in which she expressed herself most strongly—short stories. Her first published story, “Za koho ísť?” (Who to go for?) would not occur until 1893 and was quite risqué for the time, with its focus on getting a “good catch” in marriage — a theme that would recur in her stories. A key element of Timrava’s social message is the depiction of the relationship between men and women. She unconventionally presented this relationship as the naïve girl losing her illusions or reconciling with reality. In what could be described as writings ahead of her time in terms of the portrayal of women in late 19th-century European society, she developed a psychologically complex type of heroine with unusual feelings of sadness and disillusionment related to the social atmosphere of the era. This productive period was interrupted by a scandal regarding the publishing of the short story “Skúsenosť” (An experience) in the periodical Slovenské pohľady (Slovak views) in 1902. The author described her experiences as a companion to the widow of Pavol Országh Hviezdoslav (Slovakia’s greatest poet) in Dolný Kubín and presented a sarcastic portrait of relations in patriotic Slovak circles. Since her analysis did not spare even the most prominent figures of Slovak literature of the day, the editor bowed to pressure to cut or modify certain passages. This element of censorship disgusted Timrava, and she gave up expressing her views openly for a period of time. She spent the years 1904 to 1906 searching for new creative outlets, producing writings with varied focus and artistic value. Her most important works were the long novellas Bez hrdosti (Without pride, 1905) and Veľké šťastie (A great deal of luck, 1906), which went beyond traditional realistic poetics. They are distinguished by the heroine’s intense subjectivity, a relaxed structure, and a preference for literary stylisation before realistic illusion. In the short story “Tá zem vábna” (The tempting land, 1907), Timrava realistically and even ironically addressed the emotive and intense topic of emigration to America. Another work, “Márnosť všetko” (The futility of everything, 1908), is a grand exploration of basic human values in the dimensions of life and death, chronicling the tragic demise of a maid who becomes rich but is unfortunate in motherhood. Her period of mature creativity culminated in the short story “Ťapákovci” (The Ťapáks, 1914), which, through the relations within the Ťapák family, shows the passing of a social era and the tragi-comic introduction of capitalism into the Slovak countryside. She wrote the pacifistic short story “Hrdinovia” (The heroes, 1918) for a competition, but in doing so, sought to accommodate social expectations — somewhat to the detriment of the work’s artistic credibility. She returned to stylistic excellence in her 1921 short story about human misery, weakness, and suffering which was entitled “Skon Paľa Ročku” (The death of Paľo Ročka). In the short story “Všetko za národ” (Everything for the nation, 1926), the author takes a stance against the literary conventions promoted by elites in central Slovakia and their excessive attachment to the nation and folklore. Her later short stories “Dve doby” (Two eras, 1936) and “Záplava” (The flood, 1938) look ironically at social conditions associated with the changed situation in the new Czech Republic after the partition of the country just before the start of the Second World War. The plot of “Bez hrdosti’ (Without pride) centres on an unpromising love affair between the autobiographical heroine and a self-confident Hungarianised Slovak. Timrava’s self-irony, bordering on self-condemnation, may be related to her spinsterhood (as it was regarded at the time), and also may be the result of a refusal to compromise in the emotional sphere. Božena Slančíková Timrava died in 1951 and was buried in Lučenec, a town in the Banská Bystrica region of south-central Slovakia. Many of her writings are still in print, and it is fair to say that Timrava’s works have most certainly enjoyed more posthumous popularity than during her lifetime. Timrava herself has been remembered and honoured with a memorial statue in Lučenec and on a postage stamp issued earlier in the year.